Nickelodeon: Outta Control is one of Alton Towers' short lived attractions. 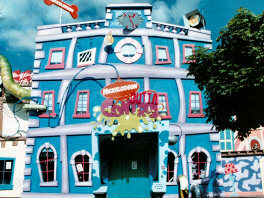 Opened in 1997 in Cred Street, the attraction involved groups of children, accompanied by their parents. In groups of 20 to 30 people, you were escorted into a room where you were invited to pretty much make as much noise as you wanted. Following this was another room full of things which when moved or squeezed, would make noises. After moving into the next area, you were given a ball and invited to 'score' into a toilet. In the next room, your shadow would freeze itself to the wall, done by using light reactive paint on the walls. The shadow would soon fade away, once the light fell onto it again. Next, the adults and children went their separate ways, with the children going across a bridge, then down a slide while the adults watched from below. Other areas followed, including an area where your face would be superimposed onto the Nickelodeon characters. Here, photographs would be also taken. After a short film about the making of cartoons, you were shown the highlights of your experience in the attraction, as the whole place was full of hidden cameras following your every move. You would then exit through the Slurp 'N' Burp café. The attraction was closed at the end of the 1998 season.